Despite budget cuts, increased maintenance needs, climate change, and the highest attendance rates the parks have ever seen, the National Park Service still strives to achieve that mission. And you know what? Having seen the parks and spoken with NPS employees, I can tell you they are crushing it! Have you enjoyed one of our amazing National Parks? There are tons to choose from! Last year, my wife Clarissa and I had the opportunity to visit four incredible National Parks, two of which you’ll find on this infographic from my friends over at Cotopaxi. Can you guess which two? Not sure where to go? You can use this Find a Park search to help find your closest National Park. Need a little inspiration? 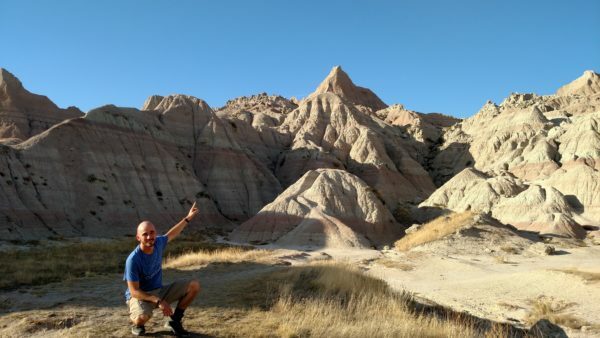 Let me tell you about some of the adventures we had in National Parks on our road trip last year to give you some ideas. Maybe you’ll find the right adventure for you! You’ll find this 242,756 acre park in southwestern South Dakota. Here, rugged terrain blends with grass prairies surrounding geologic deposits such as spires, pinnacles, buttes, and canyons, as well as a world renowned fossil bed. The Badlands were authorized as a national monument on March 4, 1929, but not established until January 24, 1939. Then it was redesignated as a National Park on November 10, 1978. 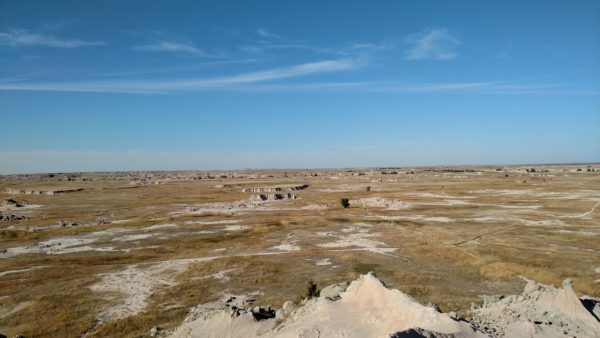 For someone from the midwest, like myself, the Badlands seem almost alien at first glance. It’s a hostile environment, but starkly beautiful as well. Twice I’ve had the opportunity to explore this gem; the first time on my honeymoon, the second on the road trip that we took last year. That being said, I could probably visit countless more times before I grow accustomed to seeing this landscape. 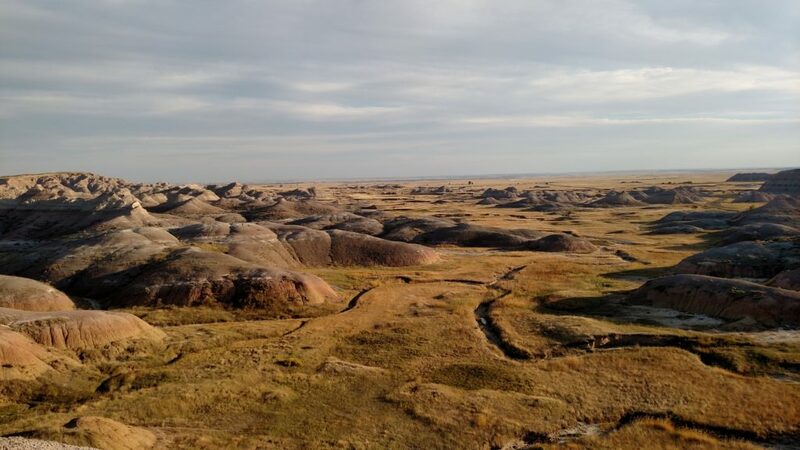 The alien landscape of Badlands National Park. There is plenty to see and do here. 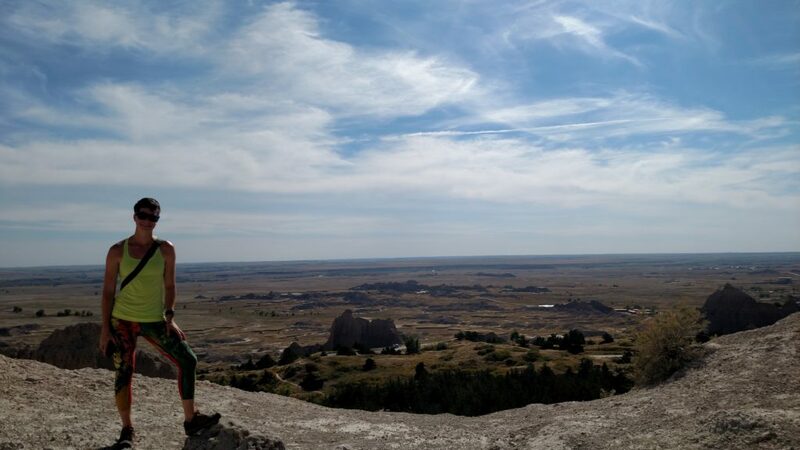 On our first visit, we spent most of our time in the park on the Badlands Loop Road, admiring the numerous overlooks. 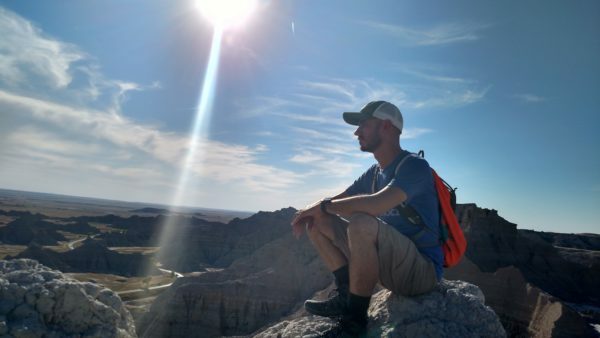 If you do nothing else, you’ll leave the Badlands having seen some amazing views. That alone is worth the cost of admission. One of the many overlooks you can see by pulling off of Badlands Loop Road. Followed by edging alongside a 100 foot drop off, before the trail eventually opens up, and then forks, leading upward to a lovely overlook of the surrounding grasslands. Clarissa in front of the overlook on Notch Trail. The trail doesn’t loop back to the trailhead, so you’ll need to return the way you came. For the second time, exercise caution when skirting the cliff and while on the ladder. The other challenge that we took on that day was Saddle Pass Trail. 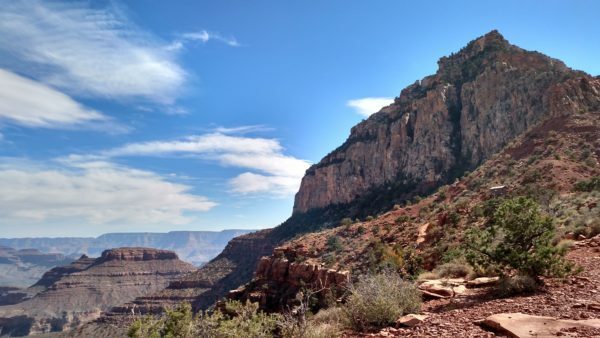 Saddle Pass is even shorter than Notch Trail, but don’t let that trick you into thinking it’s easy; the elevation gain starts right away, and doesn’t stop until your reach the top! At some points, it’ll be more of a climb than a hike, and often the ground crumbles beneath your feet. All of this equals an incredibly fun trail! Wear sturdy shoes, and be prepared to get dirty, because you may need to lean, sit, or get on your knees on your way up and down. Take your time! Make the climb, and you’ll be rewarded with a view of the plain where Saddle Pass meets the Castle and Medicine Loop Trails. Where Saddle Pass meets Castle and Medicine Loop Trails. Then look to your left and you’ll find a large rock outcropping. You want to clamber up it for a great view of the trailhead and the surrounding area. Atop the rock outcropping at the height of Saddle Pass. Unless you intend to cross the back country via the Castle or Medicine Loop Trails, you’ll need to return back down the same steep crumbling grade that you came up. Take your time, and exercise caution. That high point is where the previous photo was taken. 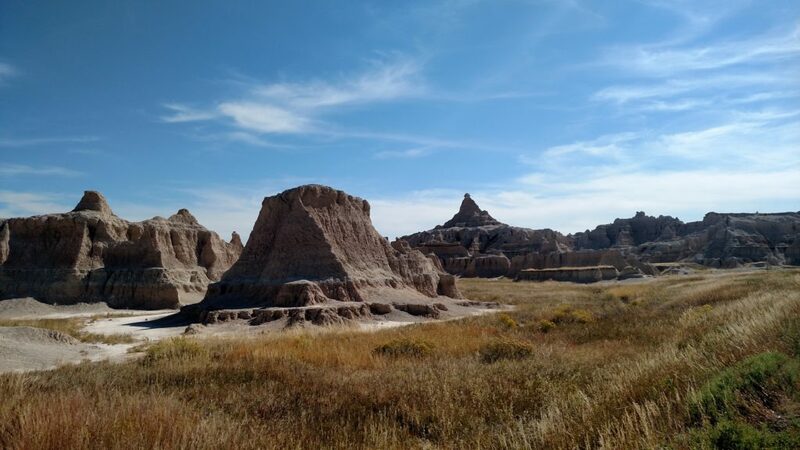 In the future, I would like to return to the Badlands and backpack both the Castle and Medicine Loop Trails, camping in the backcountry for a couple days while I do so. 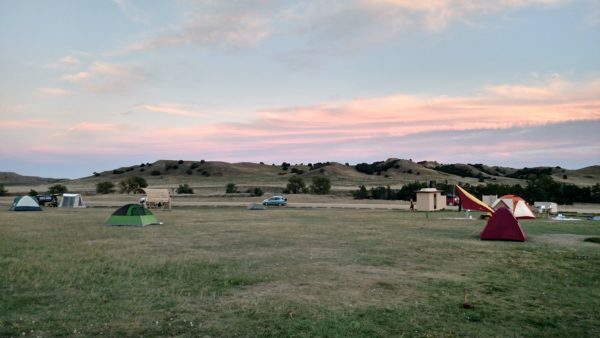 On our recent trip, however, we stayed at Sage Creek campground. The green tent is ours. Camping at Sage Creek is free, but there are no services except for garbage and a vault toilet. Make sure you bring plenty of water, since none is available on site. Don’t bother bringing firewood as fires aren’t allowed anywhere in the Badlands. What this spot lacks in amenities, it makes up for with a brilliant view of the night sky. There is so little light pollution out this way, that the entire Milky Way will pop; we spent the hours before bed soaking in a magnificent night sky, free from the bright lights of civilization. Though this campground might not be as full as the more modern sites at Cedar Pass Campground, you can expect visitors of the non-human persuasion. We awoke well before sunrise to the sound of bison stomping, snorting, and munching grass behind our tent. They continued to wander around the campsite after sunrise, much to everyone’s pleasure. This is a common occurrence here; the wildlife has acclimated to our presence, but remember that these animals are still very wild. Don’t get to close to them, and certainly do not feed them. Bison will charge if they feel threatened, so play it safe and observe from a distance. 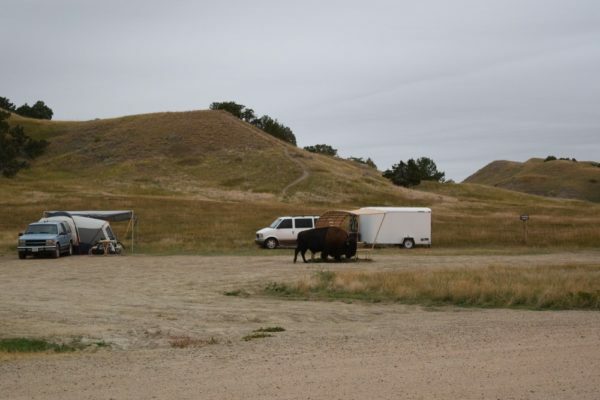 Bison roam freely in Sage Creek campground. 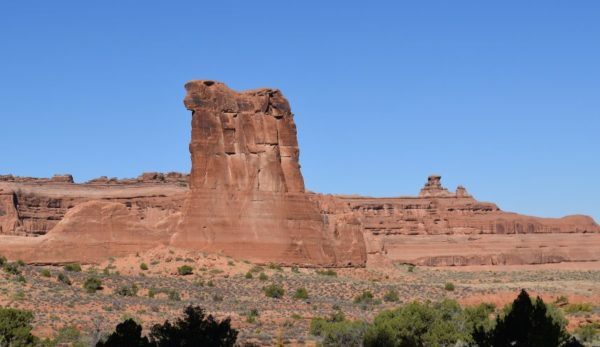 In Eastern Utah, four miles north of Moab, Arches National Park is known for eroded sculpture-like red stone formations, most notably, arches. Originally proclaimed a national monument on April 12, 1929, Arches was designated as a National Park on Nov. 12, 1971. We rolled into Arches early in the morning, and I recommend you do the same. It’s a popular spot and you will want to see as much cool stuff as you can, especially if your time is limited. Like the Badlands, you can see tons of amazing things in Arches just by pulling off the main road and taking in the overlooks. If you’ve only got a few hours this will be the best way to maximize what you see. That being said, I believe the best way to experience National Parks is with boots on the ground, so we quickly took off on foot. 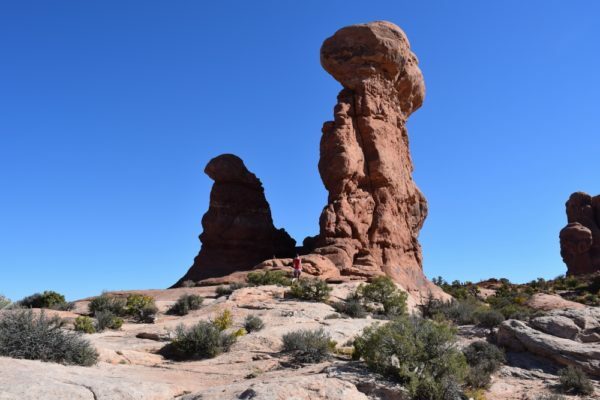 We started by exploring Balanced Rock, a short and easy loop, around the base of an aptly named rock formation. 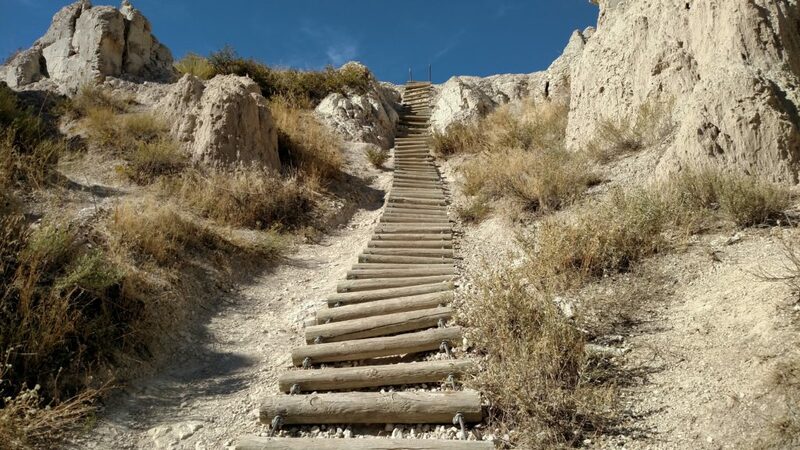 These trails are pretty easy to hike, but I hope the photos have conveyed just how lovely the formations are. 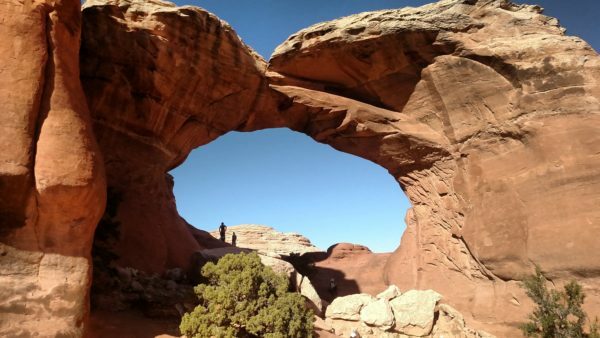 If you’re new to hiking, or have a limited amount of time, you can conquer these trails with little worry and see beautiful arches for your trouble. 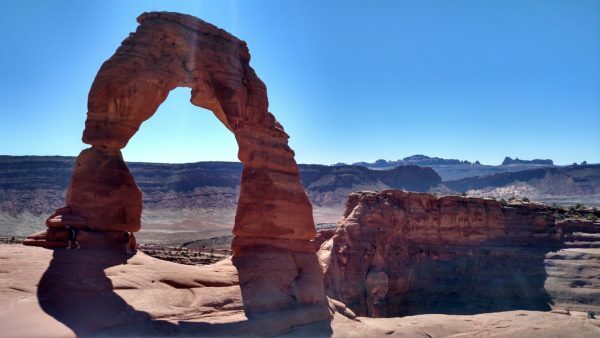 If you’re like us, however, eager for more of a challenge, consider hiking to Delicate Arch, perhaps the best known of all the formations in the park. The first steps on the path to Delicate Arch. The trail to Delicate Arch isn’t exceptionally long, but it is not an easy hike. The rangers urge you to take at least two liters of water per person, and I strongly agree. It’s hot out there during the summer, and there is no reprieve from the sun. 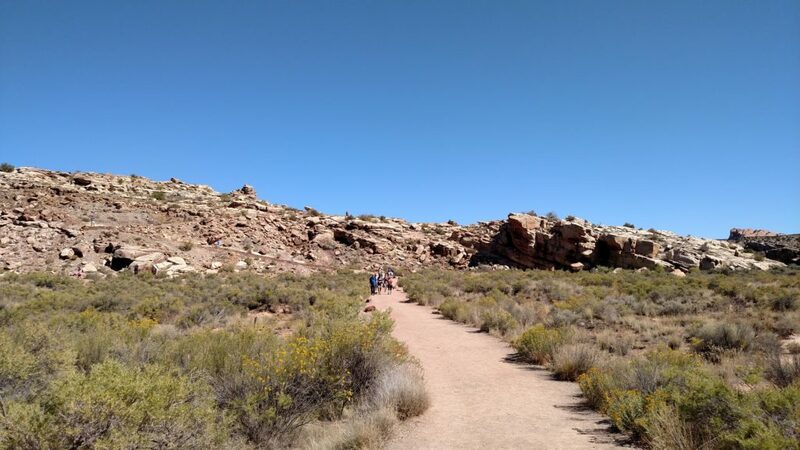 After the first half mile, you’ll be hiking on slickrock, following cairns steadily upward, and then you’ll traverse a rock ledge for the last tenth of a mile before reaching the arch. Upon your arrival, you’ll immediately recognize that the heat and haul are all well worth the effort. 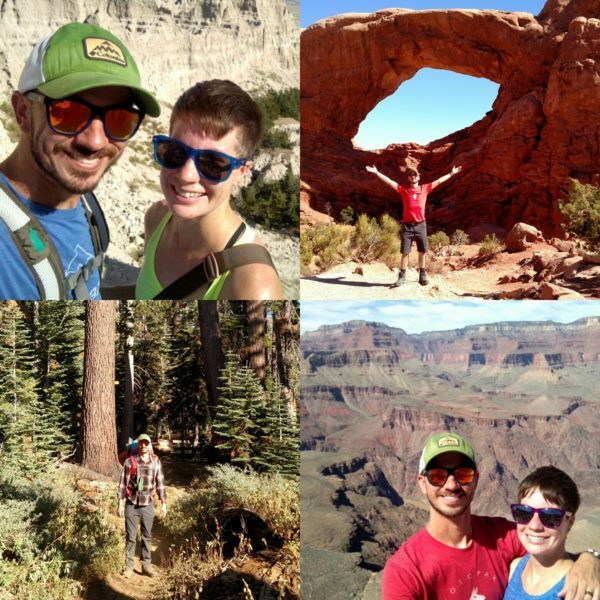 After hanging out for a bit, then retracing our steps, we decided we had a little more hiking left in us, and so we made our way to the trailhead for Sand Dune Arch, and Broken Arch trails. 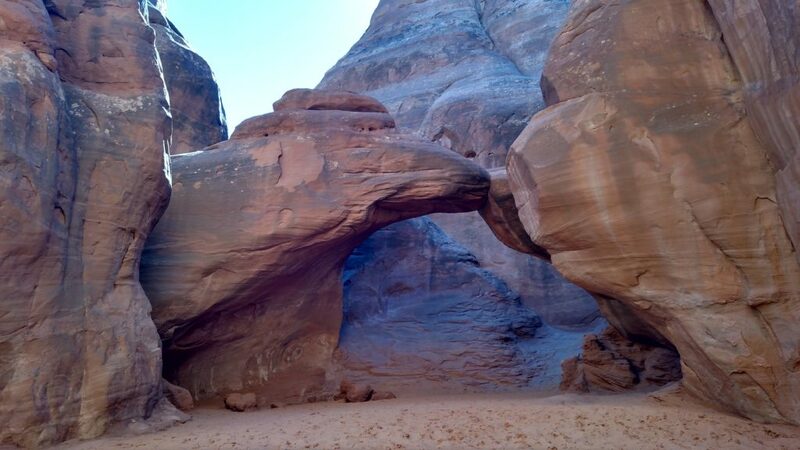 I highly recommend hiking Sand Dune Arch trail, because it’s so different from the others that we hiked while there. Hot and sunny were the rules of our visit, and the cool shade of Sand Dune proved to be the exception. Tucked between two large sandstone fins, you may even catch a chill as you walk through deep sand toward a small secluded arch hidden away in the shade. 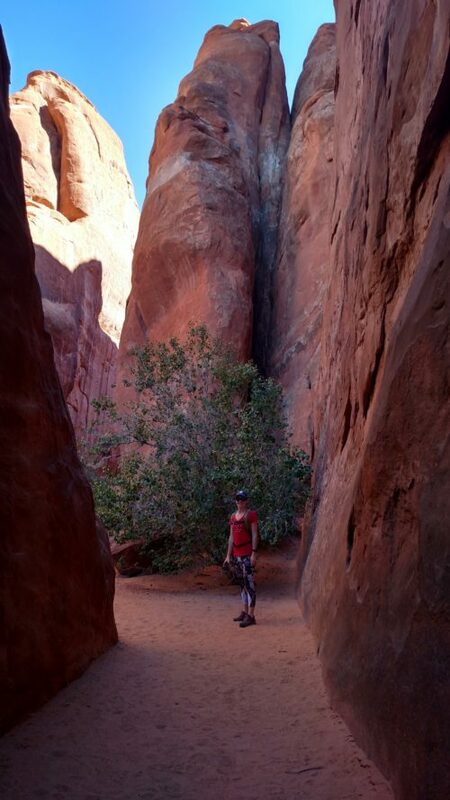 Following Clarissa as she discovered a small tree on Sand Dune Arch Trail. Unfortunately, some stones have been crumbling off of Sand Dune Arch, so exercise caution. As you venture back toward the trailhead, you can take the other fork toward Broken Arch, beneath which you will scramble if you wish to continue on the trail. Broken Arch, as we prepare to pass through it. Broken Arch isn’t actually broken; a large crack through the top does give it that appearance though. 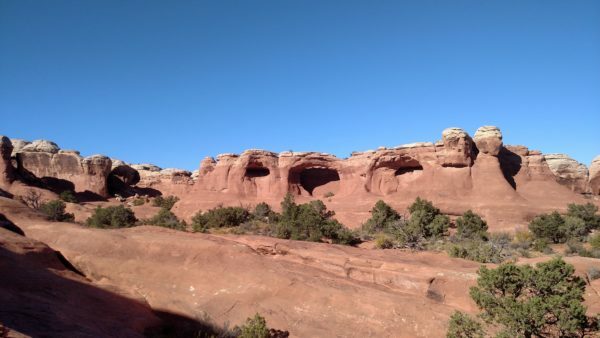 Passing through it, you can continue on the trail to Tapestry Arch and the Devil’s Garden Campground. We hiked on far enough to see Tapestry Arch from afar, but knowing that we still had a few hours to drive that night, we turned back. Tapestry Arch, spotted from the trail. 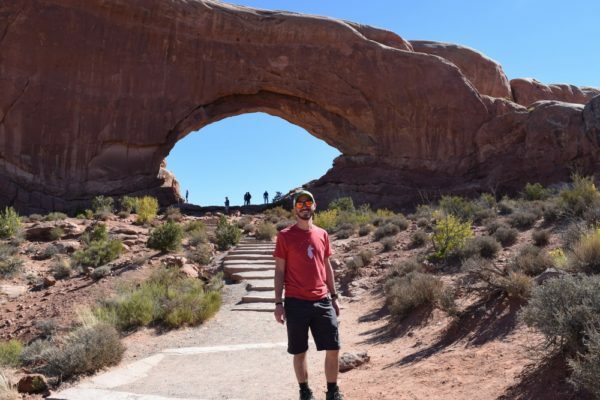 We only scratched the surface of what you can see and do in Arches National Park, and in the future we hope to return for a longer stay, and some camping in the park. 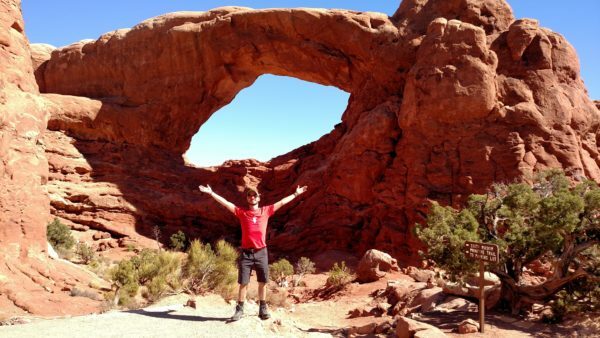 On this trip, however, returning from Broken Arch signaled the conclusion of our visit. 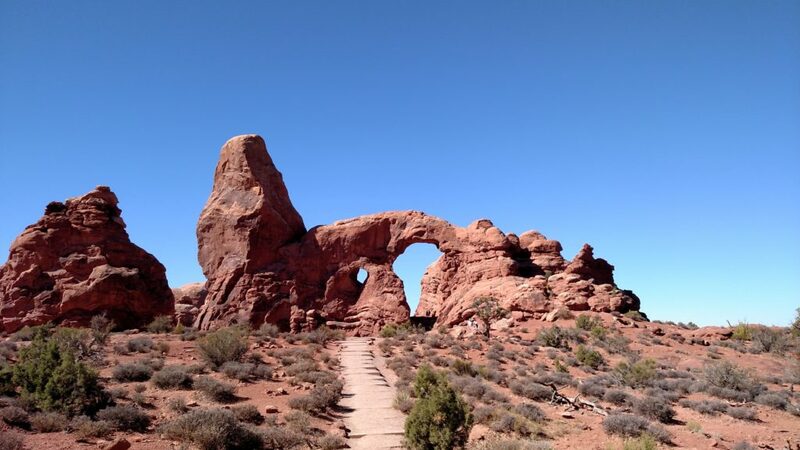 Of course, we still had to drive back out of the park, and in a place like Arches, that’s always a scenic drive. Known for its waterfalls and granite rock formations like El Capitan and Half Dome, Yosemite covers 748,036 acres, about 95% of which is designated wilderness. Established on Oct. 1, 1890, Yosemite is the oldest park we visited on our trip. 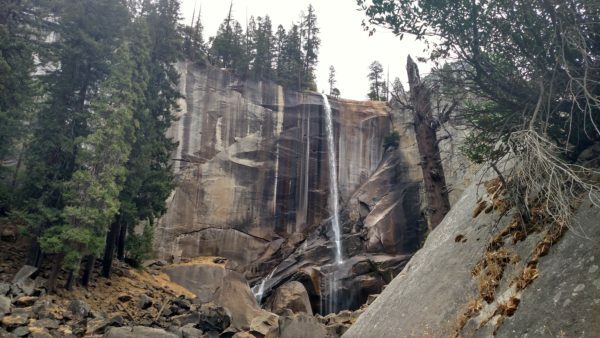 We camped in Yosemite for a week with three friends, staying in Crane Flat Campground. Even with a week, we didn’t come close to seeing and doing everything that the park has to offer. Still, we certainly enjoyed everything that we did during our visit. 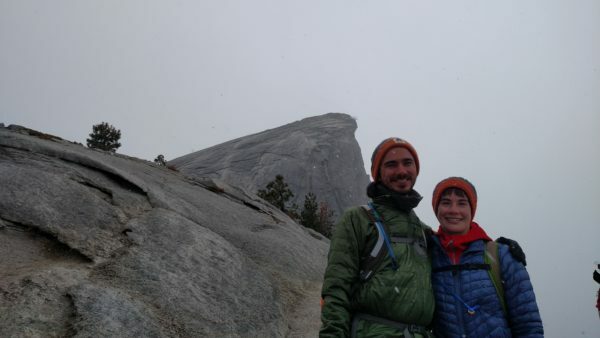 On our first morning waking up in the park, we set out for Half Dome via the Mist Trail in Yosemite Valley. 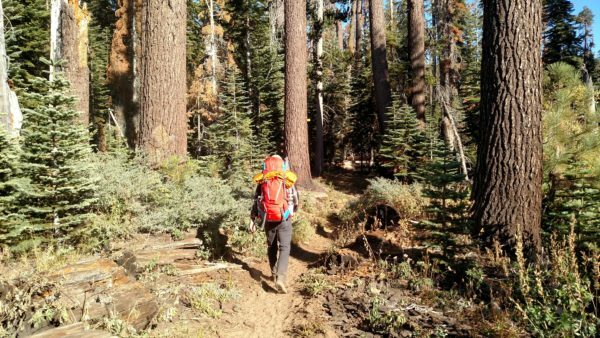 Starting from the valley, it’s an eight mile hike to the summit, with a 4,800 foot elevation gain along the way. 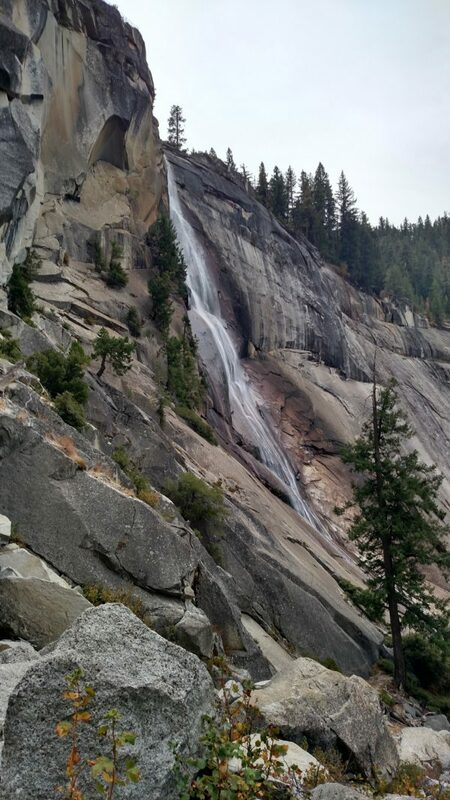 The park’s waterfalls were nearly dried up during our visit. And then Little Yosemite Valley. Many visitors will break up their attempt on Half Dome by camping at Little Yosemite Valley, which sounds like a good idea. Our crew, however, intended to do the whole shebang in one go. As you near the base of the northeast ridge, you’ll likely be stopped by a ranger checking permits. What’s the permit for? Though you’ve still got some hiking to do before you get there, the final 400 feet of the ascent is a steep upward climb between two steel cables bolted to the rock; to summit Half Dome, you’ll need to ascend via the cables. To ascend the cables, you’ll need the permit, available by lottery. Nearing the cables. Our friend Andrew assessing the weather situation. Unfortunately, as we neared the cables, the weather decided to interfere with our plans. Snow, sleet, and freezing rain pelted us from above, while a strong wind kicked up, cutting through our layered clothing. Before long, we could barely see the cables. With a touch of sadness, our crew made the decision to bail out. Clarissa and I, just before the weather hid the peak of the formation. Though disappointed that we couldn’t summit, we knew we made the right call as we watched the formation disappear from sight and noted the granite growing slicker beneath our feet. 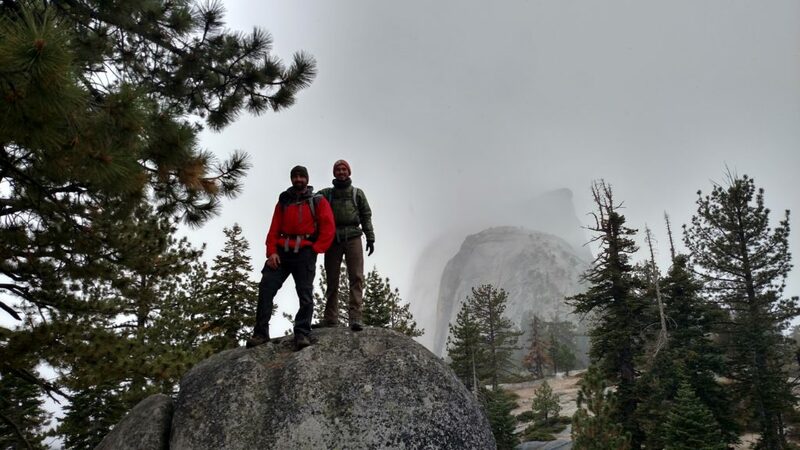 My friend Tim and I as Half Dome slowly disappears from view. We returned to the tree line and celebrated. A hike with friends is always worth celebrating, and one this challenging deserves extra festivity, even if the weather prevented us from ascending the last 400 feet. 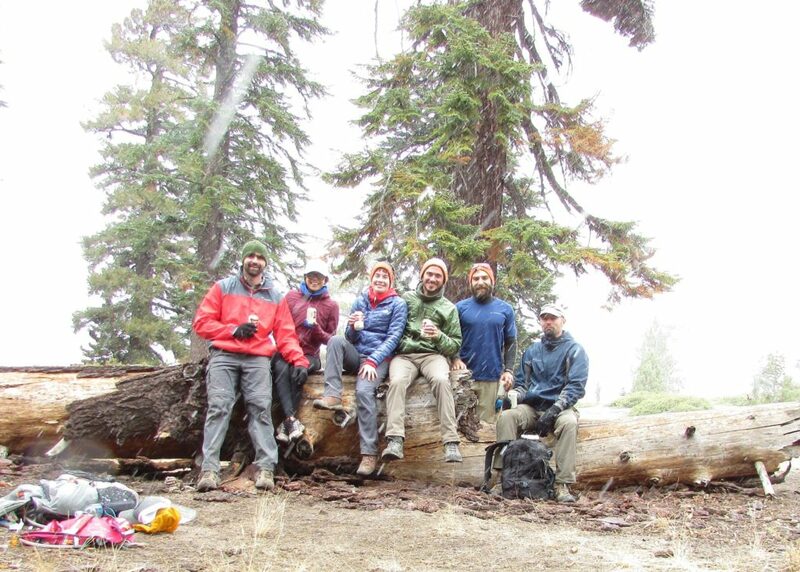 Our crew celebrating in the snow! Thanks to Andrew for the photo. Of course, once you’ve gone up, you must come down. 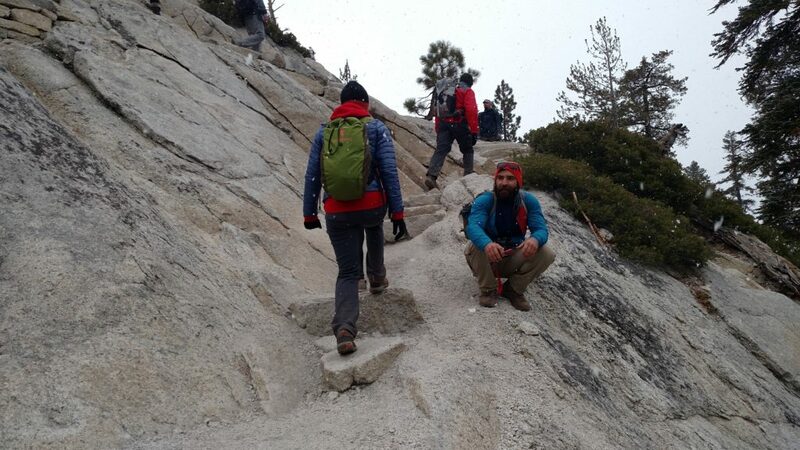 So we retraced our steps, then broke from our previous path and hiked downward via a section of the John Muir Trail so we would have different scenery on the return trip. All told, we had a roughly twenty mile and twelve hour day. We were exhausted, sore, and felt like we might collapse. We also felt free, empowered, and grateful for the opportunity to hike as far as we had in such a beautiful place. During our stay in Yosemite, we also backpacked to a backcountry camp at Ostrander Lake. 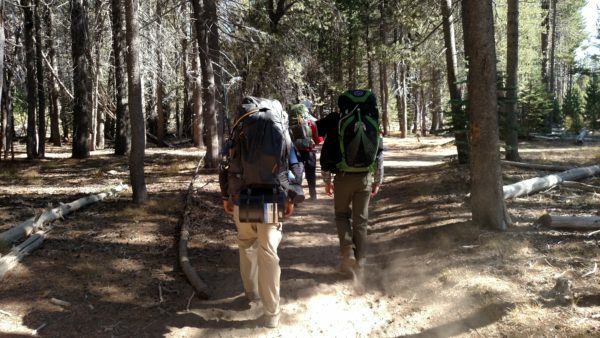 For an outing like this, you’ll need to get a wilderness permit, as well as bear canisters for food storage. We departed from the trailhead off of Glacier Point Road. 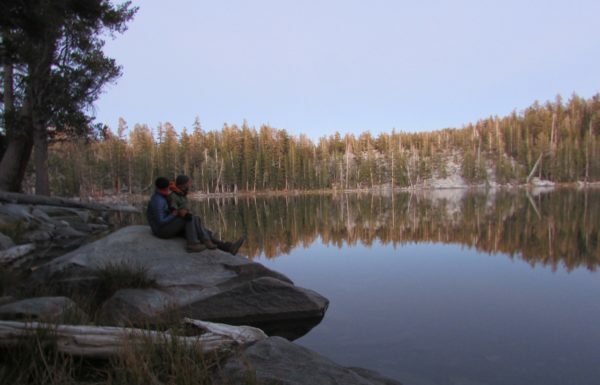 The lake is about seven miles from the trailhead and sits at 8,500 feet, a 1,600 foot gain during the hike. My Cotopaxi Taboche handled the trek to Ostrander Lake like a champ! I cannot recommend enough camping in the back country while in Yosemite. You’ll be surrounded by people in the valley, but during the entirety of our stay at Ostrander Lake, we didn’t see anyone but our own party. Our crew at Ostrander Lake. Thanks to Tim for the photo. 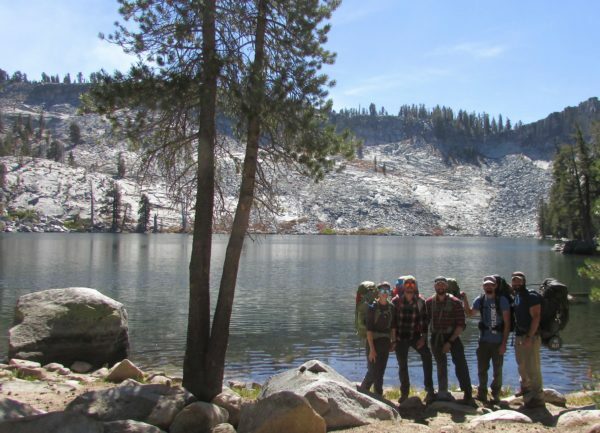 Of all the things that we did while in Yosemite National Park, backpacking to Ostrander Lake was absolutely my favorite. I would return in a heartbeat, and I look forward to backcountry camping in Yosemite again in the future. In Northwestern Arizona, covering 1,217,262 acres, you’ll find the fourth and final park that we visited in 2016. Though well-known to Americans since the mid 19th century, the Grand Canyon wasn’t designated as a National Park until February 26, 1919. 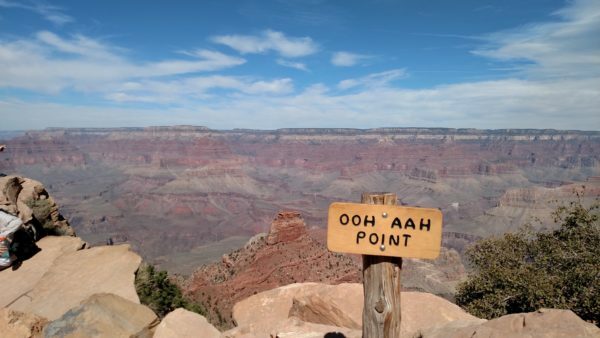 I would tell you what it’s best known for, but don’t play, you’re aware it’s known for being the Grand Canyon! When we arrived at the park, we did what most people are apt to do; we went and looked at the canyon! But with the sun starting to set, we knew we should go set up our camp. We stayed in Mather Campground, and had a much needed relaxing night’s sleep. The next morning we woke early, well-rested, and eager to get our boots dirty. 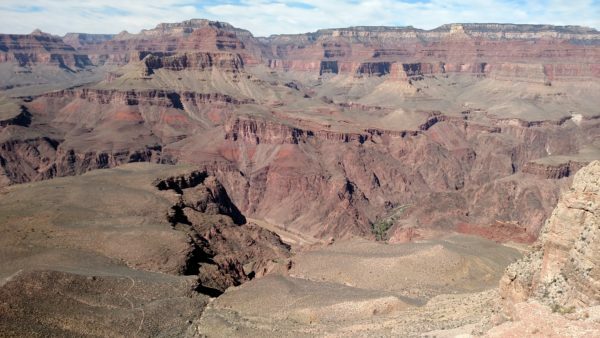 We had little interest in merely looking at the Grand Canyon from the rim; no, we wanted to get down in it. 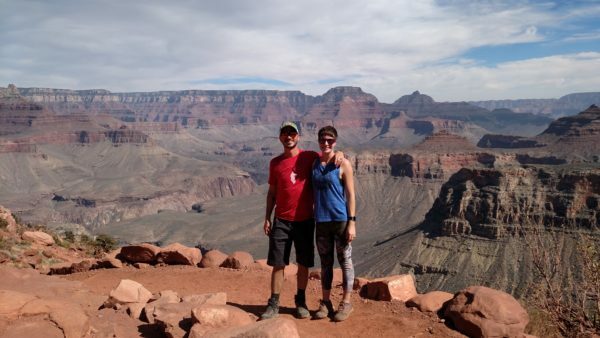 So we headed to the South Kaibab Trail. And on to Skeleton Point, where you can catch your first glimpse of the Colorado River. Can you see the Colorado River down there. We stopped here and rested. 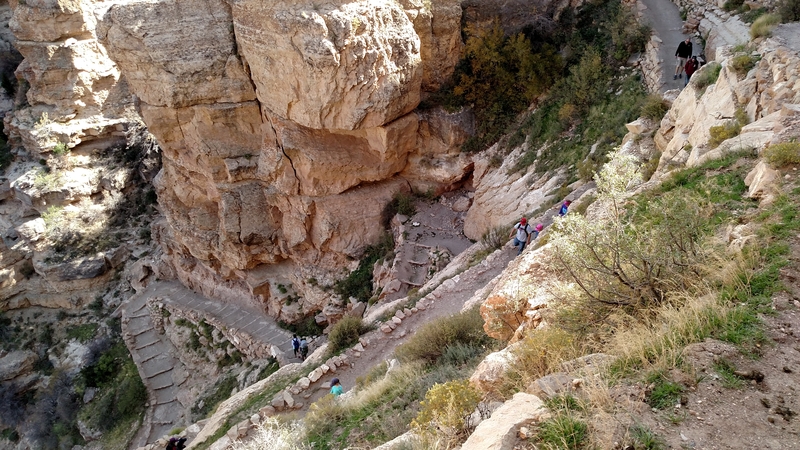 Several women headed past us, further into the canyon. When speaking with them, we learned that they had a backcountry permit and planned to camp down near the river that night. Though I was envious, I also knew that our trip was drawing to an end. After a break and a snack, we began the hike back up to the trailhead. A rim to rim hike, and related backcountry camp, will have to wait until our next visit. And I can assure you that there will be another visit. Our country isn’t perfect. We’ve got a lot of problems to work out, including many that will affect the beautiful National Parks Clarissa and I were lucky enough to visit. But there is a lot of good out there, and we feel privileged to have see so much of that goodness on our trip. The National Park Service contributes a great deal to America, and I’m grateful for their efforts. As we move into the second century of stewardship by the National Park Service, please consider showing your support, not only by visiting our National Parks, but by writing to and calling your representatives in Washington and letting them know how important public lands, National Forests, and National Parks are to America. I hope you’re planning on visiting a National Park sometime this year. If you can’t make it on one of the free days, I can assure you that any entrance fee you pay will be money well spent. The beauty you’ll find in the parks is well worth the price of admission, and you can feel good knowing that the money you spend will be used to help keep the parks running smoothly. The National Park Service is suffering from a huge deferred maintenance backlog, as well as budget cuts from Congress. The money that you spend on admission is money that the National Park Service can use to meet unfunded needs. Since we visited four National Parks on our trip, Clarissa and I invested in the $80 America the Beautiful Annual Pass. If you plan on visiting several parks in the course of a year, it’s definitely the way to go. In addition to covering the entry fees at National Parks, the Annual Pass covers admission to National Wildlife Refuges, day use fees at National Forests and Grasslands, as well as Bureau of Land Management, Bureau of Reclamation, and U.S. Army Corps of Engineers managed lands. There are also free Annual Passes for U.S. Military, free Annual 4th Grade Passes, and a $10 Lifetime Senior Pass. It’s true; the National Parks exist for the enrichment of all of us, and that’s exactly why we should visit them! To enrich our lives, to witness nature’s majesty, to garner a deeper understanding and appreciation of our culture and history. That’s why I’m urging you to visit one of our National Parks this year, and to tell me all about it. Share your National Park stories, new and old, in the comments, or on Facebook, Twitter, or Instagram with the hashtag #ParkPride. I’m looking forward to hearing from you, and can’t wait to hear your National Park stories. If you’d like to read more about my adventures in National Parks, check out my posts about our Honeymoon visit to the Badlands, as well as a more thorough write-up of our return there during our 2016 Road Trip. 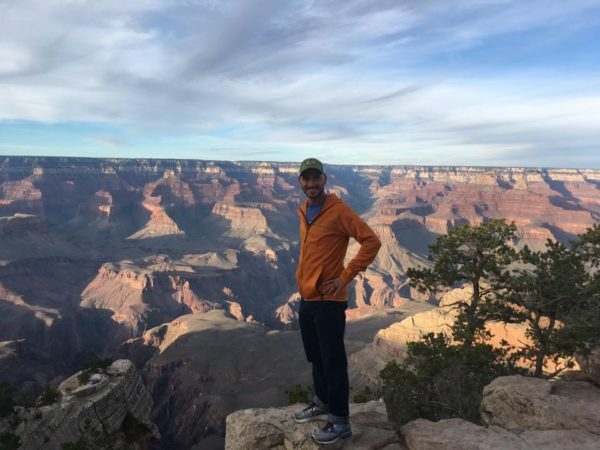 You can read more detailed posts about our visits to the other National Parks mentioned above as they’re published by checking out my series of On the Road posts, or you can subscribe to Intrepid Daily, and receive an e-mail every time I launch a new post. Thanks for reading, now get started planning your next National Parks Adventure! The National Parks are a great excuse to see the country. Back in the summer of 77 I spent a couple months exploring the west and camping out, using National Parks as way-points. I can’t think of a better way to appreciate the scope and beauty of the country.